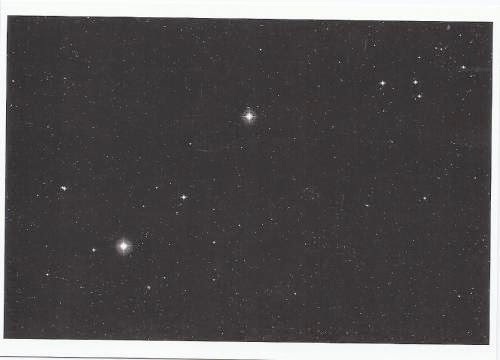 (Stars) produced by German photographer Thomas Ruff in 1989. Thomas Ruff acquired a set of 600 negative images "Catalog of the Southern Sky" from the European Southern Observatory in the Andes, Chile. Each of those images was noted for the precise time of day and exact geographic position when the photograph was taken, along with the type of telescopic lens used and length of exposure. Thomas Ruff cropped specific details from those images and enlarged them to a uniform grand scale. Separately, a pulsar, J1906, made the news as it has faded from view when it enters a warp in space-time. The observations were made at the Arecibo Observatory, Puerto Rico.